Kids cool off in the fountain in Balboa Park on March 16, 2014. There are still three days left of winter, but you’d never know it in San Diego. On Sunday, temperatures were 10 to 20 degrees above average, even breaking records in some parts of the county. The warmest part of San Diego County was El Cajon, which hit 92 degrees. This broke the previous record of 88 degrees, set in 2004. It was a hot 91 degrees in Escondido. Until Sunday, the record high there was 90 degrees, recorded in 1914. The thermometer reached 88 degrees in Alpine, breaking the East County community’s previous record of 85. At 1 p.m., Miramar had the highest temperature in the country, according to the National Weather Service. People across the county were looking for ways to beat the heat, including packing area beaches. 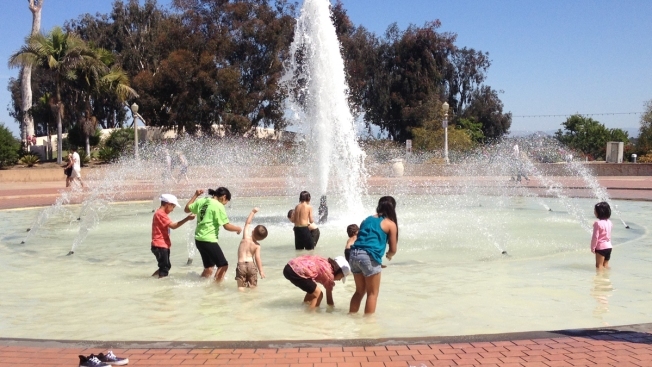 At Balboa Park's STEAM Family Day, kids took a break from the science exhibits to cool off in the fountain. However, the sweltering weather won’t last long. A cool down begins Monday as temperatures return to near average. “The biggest change will be in the coastal communities. We’ll be in the mid to upper 60s for your daytime highs,” said NBC 7 forecaster Lauren Lee.